As with the other sets of fugues sharing a key signature, these seven touch on major, melodic and harmonic minor and also an amusement in the Lydian. The first is a jaunty subject, wholly in the major with its expected answer. The second states the harmonic minor at the outset, the longer lined opening carrying the fugue subject in the treble line, then stated in diminution as fugue subject beginning at measure five. The subject is decorated with chord progressions about it reaffirming the harmonic minor. The light-hearted leap of a seventh up and ninth down characterize this subject in the major, then turn made up of thirds as punctuation against the preceding diatonic leaps. The fourth is a variant on the opening gesture of the second fugue in the harmonic minor, the subject now lengthened and ranging over two octaves. 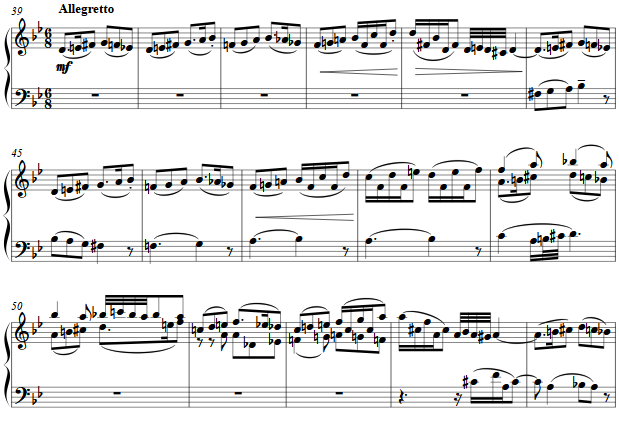 Again the theme is stated in the opening four measures, before a first statement in the accompanied fugue style. The fifth returns to the tonic, seconds and more adding diatonic zest to the relatively simple fugue subject. The Lydian is outlined in the chord successions of the opening, the fugue subject's quixotic leap of two octaves at every four measures a bit of light-hearted humor. The opening states movement from relative minor to relative major and back again, cluttered with non-harmonic embroidery. 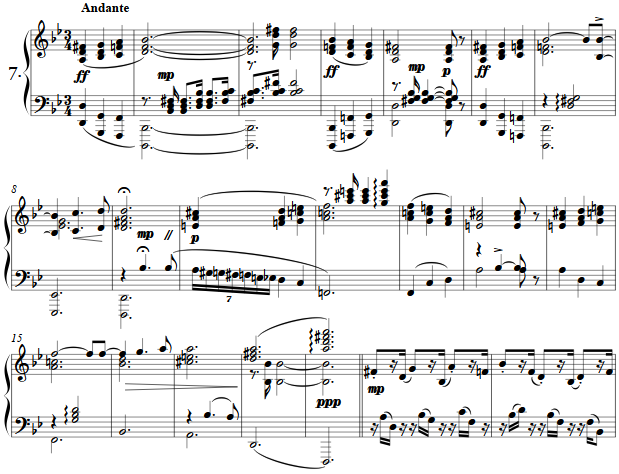 In looking back to the preceding fugues, the opening gesture moves through both major and minor and a small reference to E flat before the cadence. In fugue-like fashion this opening gesture is continued in "answer" at the dominant. The fugue subject begins in the tonic minor, rising via the harmonic minor and falling back by the melodic minor, moving then from tonic minor to its relative major for a moment before restating the dominant of the minor. Short episodic fragments drawn from the opening in 3/4 break the ongoing 6/8 as if each a hemiola, though unstressed as such.